Clearbrook’s Take a Break Volunteer Programs are an innovative service that match the spirit of volunteerism with the needs of families who have children with developmental delays. By providing them with regularly scheduled time away from parental responsibilities, volunteers and families become woven into each other’s lives to create a fabric of support. 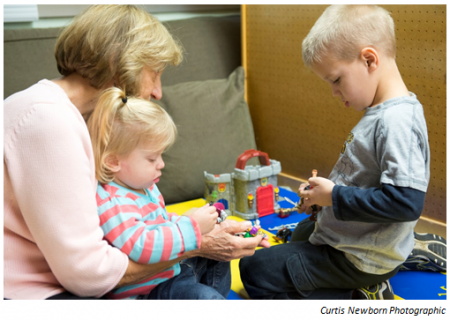 Clearbrook offers two programs: an in-home program and a supervised play-based program. Clearbrook’s in-home program provides each family with four hours of weekly respite in their homes. Clearbrook’s Take a Break in the Afternoon Program provides families with a four hour break at five locations in: Addison, Arlington Heights, Chicago, Mt. Prospect, and Waukegan. Clearbrook’s Take a Break Volunteer Program is the only program in the state to utilize trained volunteers as respite caregivers. Clearbrook provides support to families that live in northern Cook County, Lake County and DuPage County. In 2007, Clearbrook created the Take a Break in the Afternoon Program that provides supervised support to families waiting to be matched with an in-home volunteer along with families who would like their children to participate in a stay and play program staffed by Clearbrook staff and trained volunteers. Clearbrook provides support to the whole family not just the child with a special need. What are the goals of the Take a Break Programs? Take a Break assists families in their own home or at one of our Take a Break in the Afternoon locations at an overwhelming point in their lives to reduce stress, allow rest and relaxation, and reduce feelings of despair and isolation. What training does a volunteer receive? Volunteers for the in-home program are screened and receive training that includes First Aid and Child/Infant CPR, and an educational component. Personal training by families is also conducted to ensure consistency for in-home volunteers. Volunteers participating in our supervised play-based programs are screened and receive an educational component. Many of these volunteers are also CPR & First Aid certified and there are always staff and/or volunteers present that have CPR training. What about my other child(ren) that are at home? Clearbrook believes in supporting the whole family, not just the child with a special need. We will match you with a volunteer that will provide support to your family. If you participate in our Take a Break in the Afternoon Programs, you can bring your other young children as well. What kind of commitment does an interested volunteer need to make? We ask all of our in-home volunteers to complete a training that can take up to 20 hours depending on experience. We also seek a six month commitment to a family to ensure consistency. For our supervised play-based program we ask volunteers to complete a training and to commit to participate once or twice monthly from September through June. Volunteers have an opportunity to share and grow with children with disabilities through their work as a respite volunteer. The coordinator will work with you. We want this to be a volunteer experience that you look forward to participating in and sharing your time, energy and hugs. You mean, as a parent, I have four hours a week in the in-home program that I can plan to do whatever I want? Yes, families are encouraged and supported in using the time in whatever manner they choose. Whether it is to reconnect with a significant other, spend time with family, run errands, or close a door and relax in your own home. If you participate in our supervised play-based program, you can plan up to eight hours a month. Caregivers can be assured that whether in-home or supervised play-based your children are in the hands of trained volunteers who have chosen to become part of your lives. Do I get to meet the volunteer or is one chosen for me? Families and volunteers will meet and both will ultimately decide if there is a “match”. Families and volunteers have a say if they want to move forward. At our Take A Break in the Afternoon Programs you will meet the volunteers each session and the volunteer that is assigned to your child will talk with you at the end of the program and let you know what your little one was up to while you were enjoying your break. Is there a cost to participate in this program? Yes, there is a nominal fee for the respite service. Please contact the Program Coordinator for more information. A scholarship is provided to eligible families. How do I know if I am eligible to participate in this program? If you have an infant or toddler, newborn to four years old, that has a significant delay and your family needs respite relief, you are eligible to receive respite through Clearbrook’s Take a Break Volunteer Programs. Eligibility for services is not based upon a family’s financial resources. Program Coordinator – Matches families to trained volunteers based on qualifications, experience, volunteer and family needs. Recruits volunteers and provides training, assistance and guidance for all Take A Break Volunteer Programs. Provides on-going assistance and support to families. Clearbrook’s Take a Break Volunteer Program takes place in the family home. 4015 N. Oak Park Ave.
Take a Break and Take a Break in the Afternoon services are available to children birth through four years of age. Take a Break in the Afternoon (Waukegan location) services are available to children birth through five years of age. If you would like more information about Clearbrook’s Take a Break Programs, please contact Tina Yurik, Program Coordinator at 847-653-6635 x28 or tyurik@clearbrook.org.